Mavis and the rest of the delegation in Havana, Cuba. Photo by Caroline Kuritzkes. 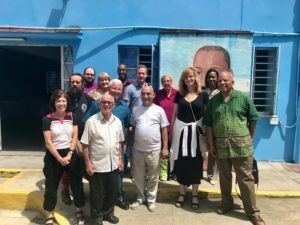 The Latin America Working Group helped organize and traveled to Cuba in September with members of church denominations who have been working for decades to end the embargo on Cuba. Our delegation included leaders from the Presbyterian Church (USA) Office of Public Witness; Evangelical Lutheran Church in America Washington Office/Episcopal Church Office of Government Relations; United Church of Christ, Justice and Witness Ministries Washington Office; United Methodist Church General Board of Church and Society; New York Avenue Presbyterian Church; Washington Office on Latin America; and LAWG. We were hosted by the Cuban Council of Churches, the leading institution of the Cuban ecumenical movement. The goal of the delegation was to better inform the U.S. churches’ advocacy in working for a change in U.S. Cuba policy. We met with leaders and staff of the Cuban Council of Churches, faith partners of multiple denominations, the Martin Luther King Jr. Memorial Center, the governmental Office of Religious Affairs. We dialogued with people representing different opinions on issues faced by Cuban church people. At the top of nearly everyone’s list was the extreme hardship caused to the Cuban family by the near impossibility of securing a visa to visit family in the United States because of the downgrading of the U.S. Embassy in Havana by the Trump Administration. Cubans must travel to a third Latin American country to apply for a U.S. visa, without assurance of a visa being granted. This is an expense that is beyond the reach of most Cubans, and it is a humanitarian issue that limits family relationships. Here is a statement from the Cuban Council of Churches reacting to the changes in U.S. policy under the current administration. Our delegation stayed at the Santa Brígida Convent in La Habana Vieja (Old Havana). We enjoyed the beauty (people, music, art) of Havana and the countryside of rural western Cuba, visiting a mission church and even a privately owned tobacco farm. Did we buy cigars? Yes, of course! We spoke with an economist about the challenges of the Cuba economy and enjoyed meals in privately-owned restaurants in Havana and at a non-state-sector ecological farm in Viñales Valley. We saw in practice the fact that religious freedom in Cuba has expanded greatly in the past two decades. Churches in Cuba have the freedom to worship and are experiencing tremendous growth and engagement in social service programs. Normal ties between the United States and Cuba will help create an environment where churches and other religious communities will expand and flourish as proud and active Cuban citizens. Our commitment is to continue our advocacy to end the embargo and to work specifically in restoring the ability of Cubans to apply for visas at the U.S. Embassy in Havana. See our toolkit to learn how you can take action.